Disney’s Boardwalk: Luna Park Pool, Promenade and What Might Have Been Hello and welcome to The WDW Radio Show – Your Walt Disney World Information Station. I am your host, Lou Mongello, and this is show #313 for the week of February 24, 2013. This week we’re going to continue exploring Disney’s Boardwalk Resort, as we recently spent time wandering the lobby and lounge to discover its stories, history and details. Now, come with us as we virtually tour the Luna Park pool area and discover what inspired this play area and its many details. Then, follow along with me and Jim Korkis and we wander the promenade around Crescent Lake, stopping to discuss the Boardwalk, shops, restaurants and details, inside and out. We’ll also discuss the “Boardwalk That Might Have Been,” and the concepts that never made it to reality. I’ll also announce a new WDW Radio event and meet coming in March before playing some of your voicemails at the end of the show so sit back, relax, and enjoy this week’s episode of the WDW Radio Show. QUESTION OF THE WEEK: What is your favorite part of Disney’s Boardwalk? What would you have like to seen be added? (Noah’s Ark? Ferris Wheel? Walt’s Attic Restaurant?) Leave your answer in the comments section below! A classic Ferris Wheel would be a wonderful addition to the Boardwalk entertainment area!! Bravo Jim & Lou!! Great show as always about the Boardwalk….Jim Korkis you are amazing with your stories & facts about WDW…Thanks for sharing those, I really enjoy listening to you and I love your books! Keep em coming gentleman! Jim, thanks for the shout out. I don’t know what happened, but the podcast I downloaded, as you were talking to me, the podcast restarted. Technical glitch. Almost drove off the road. Perhaps I can add to your education. Hanging in the Boardwalk Resort building, sorry, forget where exactly, there is a old time photo which has a round building and a flag on top. Of course this is a building built for a carousel. This is known as the Coney Island Carousel Building. Believe it is from the turn of the century. I don’t know all of its history, but after it no longer had a carousel in it, it was moved to Brighton Beach Baths and repurposed as a food court. In the 1990’s, when Brighton Beach Baths were redeveloped into a waterfront condo project, they saved the old carousel building from demolition. They dismantled it, moved it to the Aquarium here in Coney, (BTW, the Aquarium sits on the land where Dreamland was). Now for the sad part. The Aquarium kept the old wooden structure in pieces in shipping containers. Not weatherproof to say the least. The Aquarium never decided what to do with the building. Meanwhile the wood rotted away till it couldn’t be saved. The developer who helped move it to the Aquarium, removed it after the Aquarium said they no longer wanted it. The last I heard, the shipping containers were on Staten Island, where other residents complained about it. Its probably land fill now. The waste of it all. In Disneyland Paris there is a little tribute to George Tilyou. 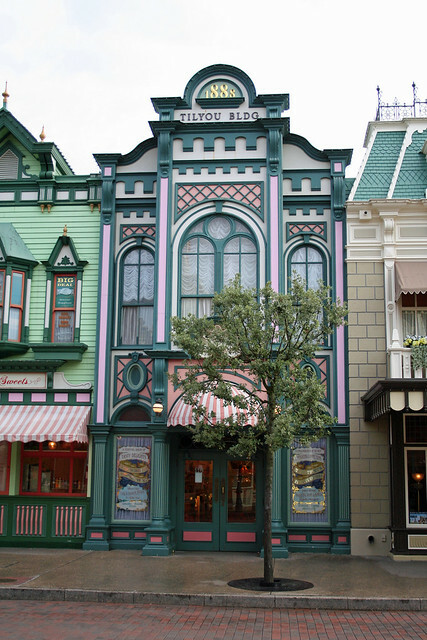 The boardwalk Candy Palace building is named Tilyou. Should pull up the clown face nanny chairs next to the big clown face outside! LOL!!! Oh boy! Love the “slap stick” story. I have the Out of the Inkwell animated short on one of Walt Disney’s Treasures DVD’s. Watched it after reading the story in one of Jim’s books, I believe? I wouldn’t mind a gurgling suitcase:0) Wow! The Boardwalk is replete with stories. What a great episode. My favorite part of the Boardwalk is, well, the boardwalk. Love to get up in the morning and walk around Crescent Lake (several times) before most are up and moving. So peaceful. It was one of the things I enjoyed most and will remember most, on our last trip down. Thanks again for an amazing show, Lou and Jim!! !